"Tangy, sweet old fashioned baked beans, are made the easy way in this side dish. This is my grandma's favorite semi home-made recipe. She makes it every Thanksgiving, and we usually end up scraping the pan clean! Never any leftovers!" In a large bowl, stir together the baked beans, onion, brown sugar, syrup, ketchup and mustard. Pour into a 9x13 inch baking dish, and lay strips of bacon across the top. Bake for 35 to 40 minutes in the preheated oven, until the bacon is browned and the beans have thickened. 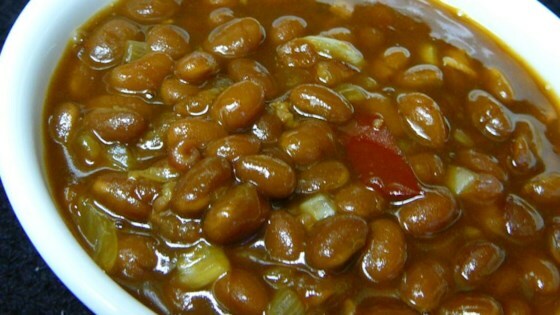 An excellent baked bean recipe using Great Northern beans! Yeah these were good. Not sure how much better they were with the extra ingredients, but yeah, they were tasty. Needed a quick and easy baked bean recipe to take to a campground with our friends. Just the right amount of everything and really delicious! Thanks Apple! These were quite tasty. I made these for a party and everyone liked them. I threw all the ingredients in my crock pot and cooked it for 2 hours on high. These were really good and easy to make. Will be making these again. Very good baked bean recipe. This is similar to how I make them, but with the addition of the pancake syrup. We really liked the flavor. This was a really easy recipe, my husband enjoyed it. I also used real bacon bits because I was in a rush, will use this recipe every time. I took these beans to a BBQ and everyone loved them, they were gone in minutes. Next time i will make a double batch. :) Thanks for thegreat recipe!